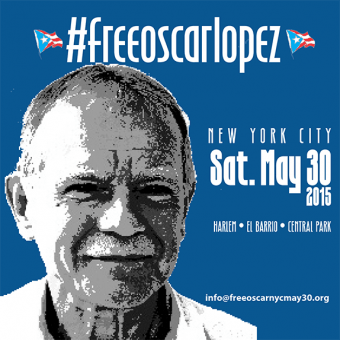 We Support Freedom for Oscar Lopez, and this is why. Iraq Veterans Against the War stands behind Puerto Rican political prisoner Oscar Lopez Rivera. Oscar contributed to the GI Resistance movement during Vietnam that helped to inspire IVAW’s mission. IVAW also values the self-determination of all people impacted by US militarism and colonialism. This includes Puerto Rico, the oldest colony in the world, and one of the United States’ unincorporated territories, or “colonial possessions” along with Guam, American Samoa and the US Virgin Islands -and the military enclave of Guantanamo Bay, Cuba. You can read more about IVAW’s mission and values here. Like many young Puerto Rican men, he was drafted into the U.S. Army and sent to Vietnam. It was there that he began to understand his identity as a Puerto Rican, seeing other Puerto Rican soldiers with Puerto Rican flags on their helmets and talking about independence and self-determination for Puerto Rico. He began to see that he had more in common with the Vietnamese people, fighting for their own independence and self-determination, than he had with the U.S. armed forces. He was decorated with the Bronze Star for his courage and valor. Like many IVAW members, Oscar’s experience in the military inspired him to become a community organizer and an agent for change. Honorably discharged from the Army, he returned home to find the plight of the Puerto Ricans in Chicago in dire straits: many close friends and neighbors had succumbed to the drug epidemic; the problems of education, housing, unemployment and health had reached catastrophic levels; and the power structure responded with negligence and bigotry. Unwilling to ignore these unjust conditions, he became a talented community organizer, helping to implement bilingual education; integrate the universities; offer educational programs in the prisons; found alternative schools, health and drug rehabilitation clinics and other community institutions; and convince the government and utility companies to hire people of color. Later, Oscar became involved in the movement to Free Puerto Rico from its status as a US colonial possession and the struggle for the Independence of the People of Puerto Rico. This is what led Oscar and 17 others to be imprisoned for seditious conspiracy - the same charge brought upon Nelson Mandela for participating in the struggle to end apartheid. Bishop Desmond Tutu has spoken publicly on multiple occasions, declaring that Oscar is a Political Prisoner. Despite never being accused of, or charged with a violent crime, Oscar has been held in prison for 33 years and was sentenced to 75 years. Oscar was offered clemency by then-President Bill Clinton but refused to be pardoned himself until everyone was free. As each of them age, they have been freed one by one and only Oscar remains. It is time to free him now.